Simply stated, a veneer is a thin covering over another surface. In dentistry a veneer is a thin layer of dental restorative material, usually porcelain that replaces enamel. Porcelain was named after its resemblance to the white, shiny Venus-shell, called in Old Italian “porcella”. 1. Brush and floss as you normally would to prevent dental problems. 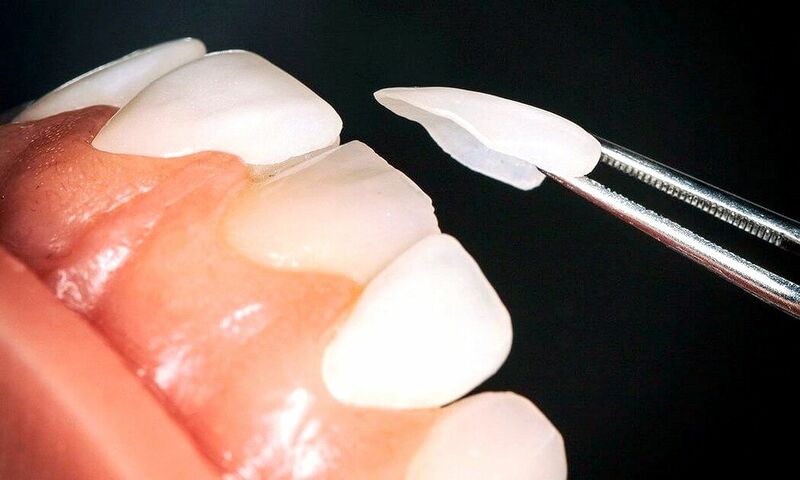 Porcelain veneers are one of the kindest restorations to gum tissues that we currently have in dentistry. Don’t be afraid of damaging your laminates by either flossing or brushing. Any nonabrasive fluoride toothpaste is acceptable. A good home care regimen will insure the esthetic success of your laminate restorations for years to come. 2. If you are known to be a bruxer or clencher, i.e. you have a habit of grinding your teeth, please let your dentist know. He or she will fabricate a protective “occlusal” or bite guard for you to wear to minimize the stresses placed upon your teeth while you sleep. 3. Approximately one week after the placement of your laminates you will be asked to return to the office for a treatment evaluation. This visit is extremely important. It gives your dentist the opportunity to evaluate the placement of the laminates, the gum tissue response and to answer any questions you might have regarding your new smile. Regular maintenance and dental check ups are recommended so that your veneers and oral health can be reviewed periodically.